You see those onions in the picture there? Those are shallots, freshly picked from the garden. It’s not time to pick shallots; but earlier this week I noticed some of them blooming. Sigh. There’s a lot of differing information about flowering shallots - whether or not they can stay in the ground or need to be harvested immediately, whether they store well or not after developing a flower, and whether shallots should even flower at all, given that we never plant them from true seed, only from clones. Shallots come in two types, French Red or French Grey. We’ve only grown French Grey once, as they are hard to source. However they were the best shallots we have ever had, hands down. French Red are more common and more easy to find, and that’s what we planted this year. I have two 4x8 beds of them. I over-planted, wanting a lot for storage, since last year our crop failed and we had to buy them all year (maddening). They’ve been doing great. But we have had a VERY wet and chilly March, and apparently that can make shallots flower. I dunno, my local land-grant college, UC Davis, has zero information about that. But other sources online say that wet and cold springs can trick shallots into flowering. And we have had an incredibly wet and cold spring. I shouldn’t be harvesting these shallots until May or even June; they don’t even form bulbs until late spring. UC says if they flower, just cut off those stalks and let the shallot stay in ground longer. Other sources say you must pull those shallots and eat them immediately. So, I’ll do a little experiment. The ones that have flowered already, I pulled and have curing above the chicken coop (except for the ones we’ll eat tonight). If more flower in the next couple of weeks, I’ll just cut the flower stalk off and leave them in the ground. And we’ll see how they do. I mean, it makes sense to me. 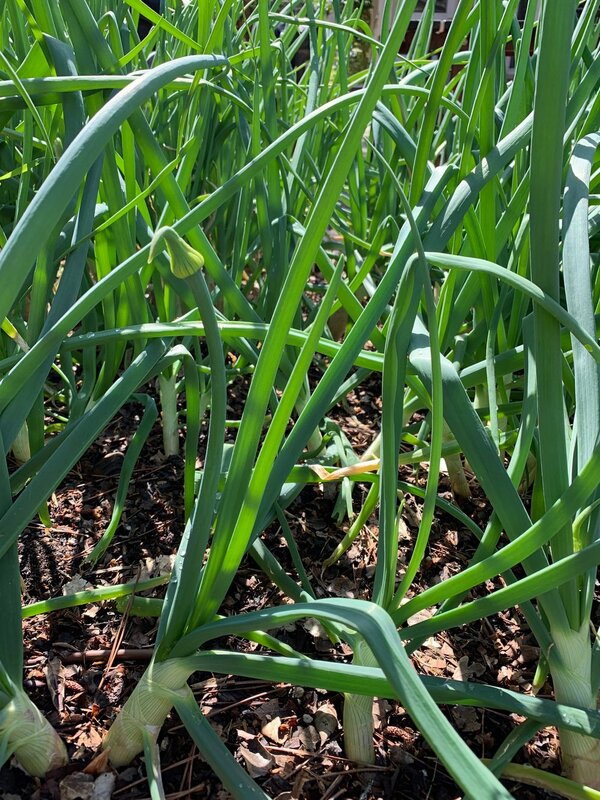 With hardneck garlic, you just cut the flower stalks off (and eat them, they are ‘scapes’ and considered a delicacy) and leave the bulbs in the ground for another month or so to grow big. With more rain in the forecast (unbelievable, really) I expect more flowering shallots.